I have been using the Nars Sheer Glow Foundation on and off for around 4 years I would say. I actually cannot believe how long it has taken me to get around to writing this post for you guys. It is just one of them products for me that I love to use, but then while I am trying something else it will get thrown to the back of my drawer, then I will dig it back out and fall in love with it all over again. I think that it is safe to say that this is my all time favourite foundation and I love how my makeup looks whenever I reach for it and I get complimented left, right and centre when I apply this foundation. The first thing about this product that I want to mention is the packaging. I love it when a foundation comes in nice packaging. At the end of the day, the packaging is the first thing you see when it comes to a foundation and this has nice, sleek glass packaging that just looks luxurious. If I am paying my hard-earned cash for a high-end foundation I want something that will look nice on my counter top. My only bug-bear with this foundation is that it comes with a screw top and if you want a pump you have to pay extra for it, but I guess it is that once you pay it once you can just switch it to your new bottle. When you apply this Nars Sheer Glow foundation it literally goes on so nice and smoothly. I always apply my foundation with buffing brushes because I feel like that gives me the best kind of look and my favourite buffing brush is the Morphe M439 that I have used countless times here on my blog before. I feel like when I use the two together it just blends the foundation out so evenly and smoothly. Honestly when you are applying this to your face it just feels like silk and unlike any other foundation that I have in my quite vast and out of control collection. When the foundation is on the skin I would say that it does have a dewy look to it, but it isn’t too much, it has a very natural glow to it rather than an actual dewy look. I was worried how this foundation would work with my oily skin, but there was no need to worry because it doesn’t affect my oils once it is set in place with translucent powder. When I do powder this foundation to make it nice and matte I feel like it still keeps a lovely glow to the skin, which is one of my favourite things about this foundation and why I keep buying it time and time again. 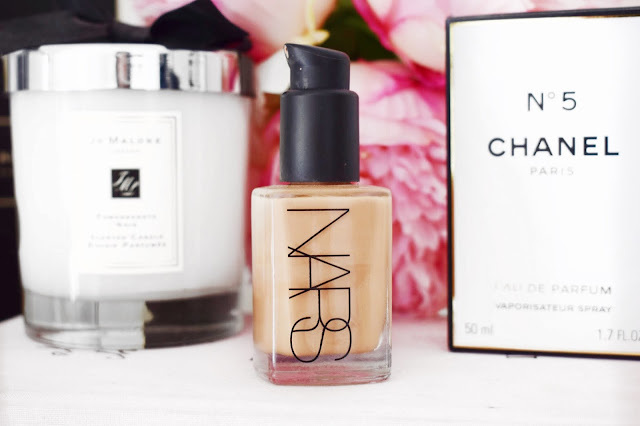 I think one of the things that did keep me from buying this Nars Sheer Glow Foundation for a long time before I went ahead and took the plunge, was the fact that it is a ‘glowing’ foundation. As a girl with oily skin, I usually stay away from foundations that have any mention of words like glowing, luminous and dewy in the title. But, after using this for such a long time, I have come to the conclusion that it really doesn’t make a difference. I just tend to make sure that I opt for an oil free primer and powder well and then I am good to go! I would say that this foundation gives a medium coverage, but it is definitely buildable. What I like to do is take a small amount of product and blend it in all over my face, then in the areas where I need a little fuller coverage I will just go back in with my buffing brush and press the foundation where I want it and it just helps to pack on the coverage. To be honest, if I went in with a little more product straight off the bat, I probably wouldn’t have to build up the coverage, but that is just how I like to apply it onto my skin and how I think it feels the nicest. One thing that I feel like I should mention about this foundation is the fact that it is very true to colour. I can apply this Nars Foundation in a morning at 7am and 12 hours later, it will still look exactly the same as when it was first applied. The colour doesn’t alter, and it looks flawless all-day long. I have such a problem with foundations at the moment changing colour throughout the day and this is another reason why I am head over heels for this beautiful foundation. When I wear this foundation I always get so many compliments off people because it just makes the skin look really healthy. Another great thing about this foundation is the amount of shades that they carry in their range. I have a friend who has dark skin and she swears by it because it is the only high-end brand that she has used that have foundation for really deep skin tones. Nars have always been known as a great brand for catering for so many different skin tones from incredibly light to beautiful deep tones. I am pretty sure that I paid £31 for this foundation from Space NK and then the pump was an additional £3 I think the first time that I bought it. I really cannot recommend this foundation enough and for that price I think it is absolutely perfect. If you haven’t tried this foundation before, I suggest that you go out and at least get a sample of this foundation because it really is out of this world. As normal I will leave a link down below to where you can check this foundation out. Also, if you have any comments or questions about this Nars Sheer Glow Foundation just leave them below and I will get right back to you. this sounds like such a great foundation, thanks so much for the indepth review. i would have to bring all the pumps i have to see if any of my existing ones would fit already! That is a good idea, it would make it a touch cheaper too! This is a great foundation I love to use it on clients! I wish I had this in my collection when I was working freelance, it is such a good foundation! It is such a good foundation, I wish I hadn't put off trying it for so long! I know, that is the only downside of this foundation for me! I can see myself repurchasing this for a very long time! I want to get this foundation so bad! Thanks for the amazing review! Thank you, it is such a good foundation, well worth the money!